Wellness Policy Guidance - START HERE! Wellness Policy in Action - START HERE! Get Involved - Start Here! In each of our monthly eNewsletters, we spotlight a school or district that is doing something effective and exciting to promote a healthier school wellness environment! We hope these best practices will be replicated or customized in other schools and districts, and if you need more information or have a best practice in your school to share, feel free to contact us at info@rihsc.org. Caroline Reilly, a three-season athlete at EGHS, values healthful eating and loves working with children, so teaching nutrition to kids was a natural topic for her senior project. While working alongside her mentor, URI Snap-Ed Registered Dietitian Paula Paolino, Caroline volunteered at two different summer programs; the YWCA in Woonsocket and the Learning Community in Central Falls. Each week, she guided children through interactive learning activities featuring fruits and veggies, taught them how to prepare simple healthy snacks and got them active with some games. Her favorite activity was the “Fruit and Veggie Dance Relay” where everyone learned about fruits and vegetables while performing a variety of dance moves! Check out this terrific video Caroline made for URI to use in their programs to encourage more kids to eat healthy. Congratulations Caroline!! Job well done. Healthy New Dishes for Athletes (and Everyone)! The Athlete’s Choice program at North Smithfield High School is a partnership with PE teacher Christina Lima, students and Chartwells Food Service. Chartwells chefs developed breakfast and lunch recipes specifically designed to nourish and fuel athletes. First, PE students learned during class how food is transformed into energy and building blocks for their bodies. The better the food, the better the energy and fitness! Next, they tasted and selected a number of dishes for sampling to their classmates during lunch, which has resulted in regular cafeteria taste-testings of new, delicious and healthy choices that everyone (not just athletes!) can love, such as Korean BBQ Rice Bowls and Philly Steak & Cheese Rice Bowls. YUM. And students' feedback counts - the most popular dishes then become regular menu items! ​Well done, North Smithfield High School and Chartwells! 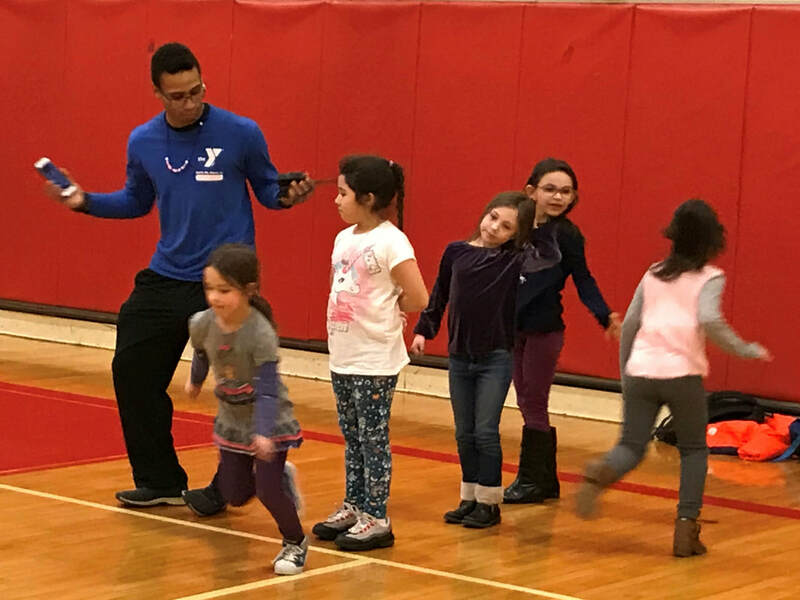 ​Narragansett Elementary School offers before/after school care onsite provided by the South County YMCA with Mr. Chris, who heard about and then attended a BOKS training.sponsored by the University of Rhode Island. BOKS (Build Our Kids’ Success – www.bokskids.org) is built on the simple fact that physical activity, especially before school, can improve both classroom performance and behavior. It teaches motor skills, functional fitness movements and teamwork, while building confidence and healthy habits. Mr. Chris incorporates the BOKS curriculum with the students twice a week. “Everybody can participate and play,” said Mr. Chris, as he led a group of eager and active kids through a jumping routine. “The kids know when it’s a BOKS day and always come prepared wearing sneakers.” Teachers also notice when it’s a BOKS day and notice that the students who participate are more settled and ready to learn when the instructional day begins. Mr. Chris wants more NES students to have fun and get the BOKS benefit so he’s working with the PTO to offer spots to students who aren’t a part of the YMCA childcare program. Nice work South County YMCA and BOKS! At Alan Shawn Feinstein Middle School in Coventry, ASFMS staff discussed ways to address social-emotional learning (SEL) with students. They came up with several great ideas to implement this school year, and the programs are in full swing! The biggest commitment is the school's adoption of the Jesse Lewis Choose Love Enrichment Program, a no-cost social and emotional learning program, delivering a ready-made curriculum aimed at making school culture one of safety, peace and love, while addressing the bullying issue and creating a sense of belonging to the school community for both students and staff. Additionally, each day at ASFMS begins with a mindfulness exercise during morning announcements to give students a sense of calm and ready them for a day of learning. Faculty meetings begin the same way. There is a yoga room for students who could benefit from some extra relaxation and the Alternative Learning Center is equipped with softer lighting and music, creating a peaceful atmosphere to decompress. ASFMS is dedicated to educating the "whole child" by teaching their students vital academic AND social-emotional skills they can use for a lifetime. GREAT JOB, ASFMS team! On "HIGH FIVE FRIDAY", Scituate elementary school students get a super special greeting when they walk into school. On Friday mornings, Scituate High School students travel to one of the town's three elementary schools to welcome the kiddos to school with a receiving line of high fives, and then join them on the playground for before-school recess. We visited Clayville Elementary on a recent Friday to see the program in action, when six members of the SHS girls volleyball team came to interact with the Clayville kids. What a great, feel-good program that touches on social emotional well-being as well as healthy physical activity with the extra before-school recess!.The high schoolers giving the high fives are just as enthusiastic as the elementary students receiving them! ​What a way to start the day! Surroundings matter! In order to promote healthy eating, it's important to have great-looking and great-tasting nutritious food, but it's also a big plus to have a bright, colorful and inviting cafeteria space! West Warwick Public Schools and their food service provider Sodexo have accomplished both. West Warwick High School, in partnership with Sodexo, upgraded their cafeteria, with new tables and decor in the school's vibrant black and orange school colors, along with video menus and colorful flags of the world painted on the walls. The beautiful new cafeteria serves as a backdrop for a new Sodexo food initiative implemented at WWHS called Taste4. It features five food stations emphasizing fresh, build-your-own food bars with expanded flavorful menu choices. West Warwick and Sodexo have also invested in a "Leafy Green Machine", a farm-in-a-box built entirely inside a 40-foot shipping container. They are harvesting 300 heads of fresh lettuce a week for school lunches! Great food in a revamped, eye-catching cafeteria - perfect! Shout out to West Warwick Public Schools and Sodexo's Donna Walker and her team! What a treat to visit Central Falls High School and see this delicious food! And yes, it's SCHOOL LUNCH, courtesy of Chartwells and Food Service Director Solange Morrissette. Students, staff (including Central Falls superintendent Victor Capellan) and visitors alike enjoyed the feast, which included locally grown corn on the cob, both plain and chili lime, pork carnitas tacos, beef tacos, corn and pineapple salsa, and cilantro lime rice! Delicious, healthy meals that incorporate local foods are indeed possible. North Providence High School was treated to the same fiesta the next day with FSD Donna Humphries....and it's on the menu again this month! Nice job, Chartwells! Slater Middle School’s "STEAM" garden flourishes! 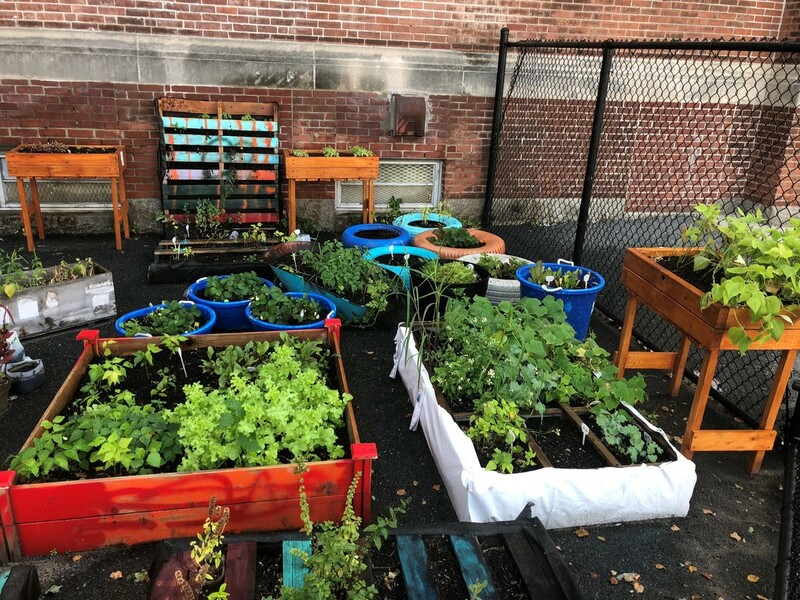 We loved seeing the “tweet” from Slater PE teacher Brian Kampper thanking the custodians at Slater Middle School in Pawtucket for tending to their garden all summer. It’s flourishing!! The garden was started with funding help from Fuel Up to Play 60, a school Fun Run fundraiser, and a few dedicated teachers and students. Health and STEAM classes plant, harvest and use the garden as an outdoor classroom that brings learning to life. And plans for indoor gardening during the winter months with hydroponics and aquaponics will extend the learning for even more students. Check out more Slater garden photos and the “Salad Party” they had after their first harvest. Our School Garden Resources webpage has lots of resources to get started with a garden in YOUR school. For years, the Lincoln wellness committee has ensured that students have a seat at the table. Quite literally. Student representatives have been a part of this well-run committee for many years and are very much a valued part of discussions and decision making. Lincoln wellness meetings are scheduled in the morning at the high school, coinciding with Advisory Period, to make it easier for student participation. Cameron Deutsch has been a faithful member of the committee for two years. His insight and perspective was often solicited and his contributions respected. He brought forward the topic of a later high school start time and completed his Exhibition Project during junior year on the subject. His experience as a valued member of the Lincoln wellness committee has piqued his interest in running for school committee in the future! ​All 200 K-5 students at Wakefield School were able to experience the texture of various grains and taste tabouli (a salad made with whole wheat bulgar) while learning about the benefits of eating whole grains during a nutrition education lesson. PE teacher James Champion and Chartwells Director of Dining Services Jack Jones team up every few months with fun presentations designed to encourage kids to make healthier choices in the cafeteria and at home. It’s all part of the school’s commitment to the 5210 healthy program and it’s making a difference! Most of the students were happy to try the whole grain tabouli and some asked if it could make a regular appearance on the lunch menu! Students in Woonsocket’s 10 schools can now share any unwanted, unopened food or beverage instead of throwing it in the trash. Each school cafeteria now has a SHARING TABLE which is simply a basket and cooler (with ice pack) available to students to either leave or take items during breakfast and lunch. The food service staff from Sodexo ensures any leftover items are thrown away at the end of the day and the coolers and baskets are cleaned and sanitized. Now more kids are getting the food/drink they need and less perfectly good food/drink is being wasted. A win-win! Nancy Crowell from North Smithfield Elementary School has been a Phys Ed/Health teacher for 28 years and knows the benefits of regular physical movement for good physical and mental health. She recently began offering a free before-school Eccentrics stretch class for her colleagues as she finds it a great way to start the day! The class meets weekly at 7:00AM in the library where it’s warm and quiet and the lights can be dimmed. Teachers arrive wearing comfortable clothing with a yoga mat. Nancy leads a series of gentle stretches and strengthening exercises that help relieve tension, soothe joints, improve mobility, posture and balance and increase ENERGY! No heavy sweating involved so teachers can go right into the classroom at the start of the school day. Participating teachers love it and feel great. Nancy has been asked about an after-school class for those who can’t make the early morning hour so she anticipates helping more teachers find better health right at school. 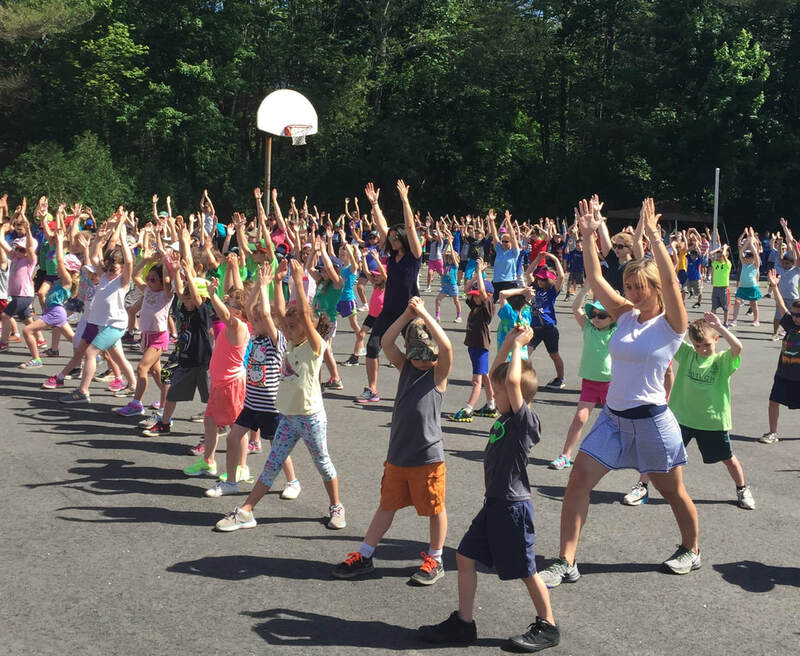 ​Traci Westman, principal of Newport’s Pell Elementary School, combined her desire to get kids physically active before the start of school with her need to be creative with the school day schedule. Pell Pump it Up was the result! Starting this school year, twice a week for 15 minutes at the start of school, all 700+ K–4th graders gather on the playground (or in the gym and hallways during inclement weather) with PE teachers leading calisthenics (such as jumping jacks, squats and lunges) ... some teachers even join the fun. There are a lot of moving kids, so adults are assigned to spots on the playground/hallway to ensure safety, and high energy music has been introduced to get the kids more “in the rhythm” of the new program. The kids love it! The next step is to survey classroom teachers to see if students are better prepared to learn on Pump it Up Pell days, but our guess is ABSOLUTELY. How's this for an innovative (and fun) concept: a blender attached to a spin bike, pureeing fruit for a healthy yogurt smoothie. That's exactly what is happening in Providence middle schools! 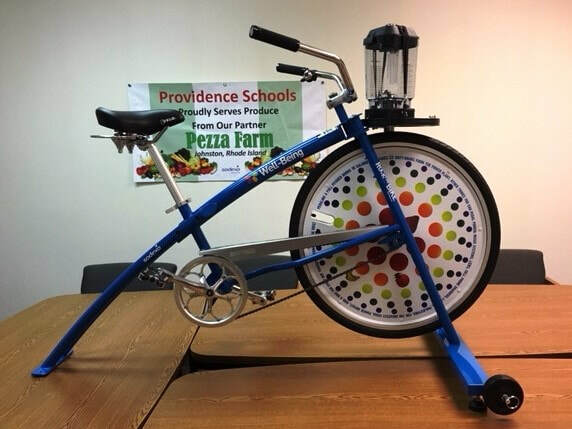 In order to increase school breakfast participation, school food service company Sodexo purchased the bike, which is outfitted with a pedal-powered blender, perfect to puree fruits to top yogurt smoothies! Talk about a double whammy of healthy behavoir - excercise and great nutrition together, with green energy thrown in for good measure. ​Barrington invites students to “Think Your Drink”! People, especially kids, don't realize the enormous (and unhealthy) amount of sugar in some of the beverages they drink on a daily basis. Barrington school nurse teachers and Chartwells School Dining Services wanted to educate 5th and 6th graders on the on the topic AND offer delicious alternatives to sugary sodas and energy drinks. Chartwells’ nutritionist Nancy Roberts and executive chef Steve DaFonseca conducted several "Think Your Drink" presentations at Barrington Middle School and Hampden Meadows Elementary with a visual display of the actual amounts of sugar in their favorite beverages. 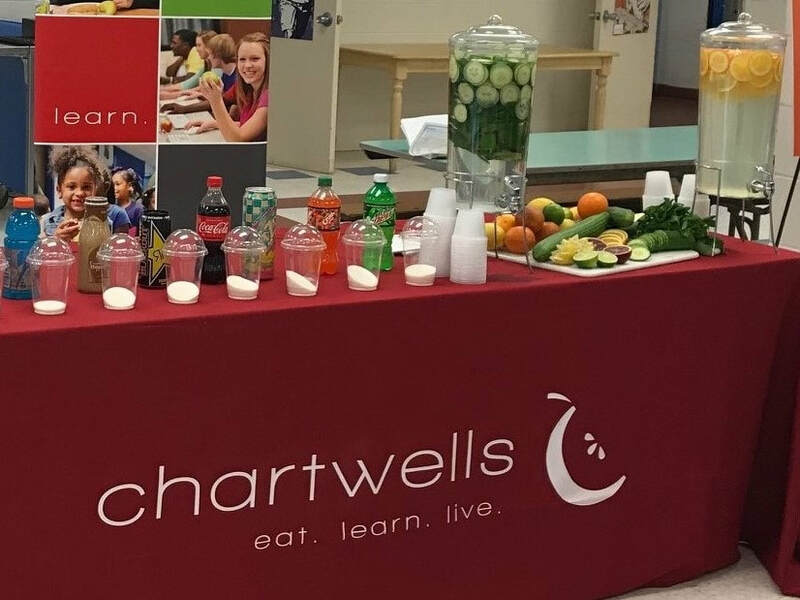 After the formal presentation, the Chartwells' staff took questions from the kids and offered them infused water samples to try as an alternative to their favorite sweetened beverage. Making the switch from sugar-sweetened drinks to plain or infused water is a great step towards better health! ​Cumberland has RI's first Leafy Green Machine!! ​What is a Leafy Green Machine?? It is a modified shipping container capable of producing a football field’s worth of vegetables every seven weeks......right outside of Cumberland High School! The Leafy Green Machine (www.freightfarms.com) is a hydroponic growing facility that, with an innovative, climate-controlled atmosphere, will supply Cumberland schools with consistent year-round harvests of fresh produce for school meals. How great is that?! Cumberland has purchased the LGM and Sodexo Food Service Director Shauna Spillane and Food Service Manager Gina Rodriguez will oversee the growing and harvesting of the leafy greens and use them for fresh, delicious salads. Shauna told us, "We have planted and are in the germination stage for another 2 weeks, after which the seedlings will be placed into vertical columns, ready for harvesting 4 weeks after that. It's a 7-week turnaround from seed to harvest. We are so excited - we'll be harvesting over 700 heads of lettuce and kale a week!" At Captain Isaac Paine Elementary in Foster, they are transitioning into a new school week with a mindfulness activity during morning announcements! Principal Kristen Danusis and teachers participated in a 90-minute training and practice on implementing mindfulness into their classes, led by one of the school's terrific parents. They practiced kid-friendly yoga postures and various team building and mindfulness activities, which they then could teach their students. The school has now launched "Mindful Mondays" with a mindfulness practice included in morning announcements. Danusis says, "It's a great way to get our heads in a good space to begin school and build new tools to help students sustain focus, reduce stress and anxiety, and build problem-solving and collaborative learning strategies! Here's to a great year!" An East Providence health teacher and Chartwells (East Providence schools' food service provider) teamed up to develop an interactive lesson that would get teens thinking about their breakfast choices. Comparing fast food chain options with homemade healthier options (bacon, egg and cheese sandwich vs steel cut apple oatmeal / coffee coolatta vs berry smoothie), the students learned about food labels, did a nutritional analysis to determine the nutrients and calorie count of each, and tasted the healthier items. ​Finally, they rolled up their sleeves (and put on their gloves) and prepared their own smoothies. Not only did they learn that healthy foods can taste really good, but making your own breakfast is easier on the wallet as well! And thanks to this project, the students launched a smoothie bar and their Berry Berry Kale Smoothie actually ended up on the school breakfast menu for all students to enjoy! ​Use Fuel Up to Play 60 for Healthy School Environment Improvement! ​Teachers, school nurses and administrators: Do you want to help your students make healthy changes to their school environment? Check out what Program Advisor, Colleen Crotteau is doing at her school through Fuel Up to Play 60. 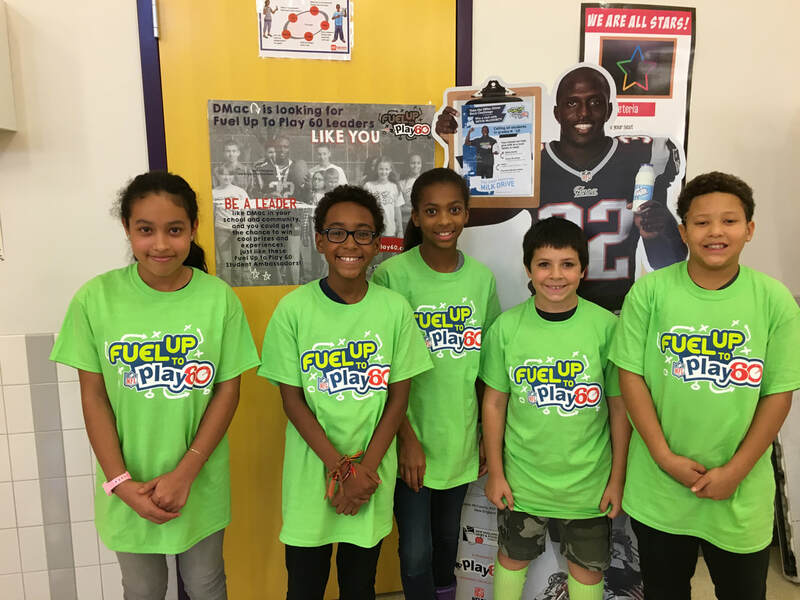 The Fuel Up to Play 60 team at Claiborne Pell Elementary School in Newport has been busy putting “plays” into action. In September, Pell received a FUTP60 grant ​for $3760 to implement “Highlight Healthful Foods Everywhere in School” and “Ramp Up For Recess”. With the smoothie makers purchased with the grant money, Pell hosted a HEALTHY Banana Split smoothie taste test……and tasters LOVED it! The team is also supporting their community - it raised $165 to purchase milk for local food banks. As part of this program, Pell has also partially implemented Breakfast in the Classroom, with plans to expand, and will be painting the playground for a circuit of activities, which will increase movement at recess. Students are really excited to be part of the Pell Champions Fuel Up to Play 60 Team. Ready to make a change? Visit FuelUptoPlay60.com and NewEnglandDairyCouncil.org to learn more and/or contact Jane Vergnani at jvergnani@Newenglanddairy.com or 401.667.3991 to schedule a meeting. A school survey indicated that many students at Marieville Elementary must often prepare their own meals at home. A wonderful crockpot program was borne out of the desire to teach them how to prepare a healthy meal and learn about knife and food safety. As part of the North Providence Marieville Health Equity Zone (www.nphez.org), crockpots were purchased for students and each week a new recipe is cooked in the crockpots during the day. ​The students taste-test the meal, receive the ingredients necessary to cook the meal at home in their free crockpot, and prep any necessary foods during class. Survey results confirm that students are consuming more fresh, hot and healthy meals at home because of this innovative program! 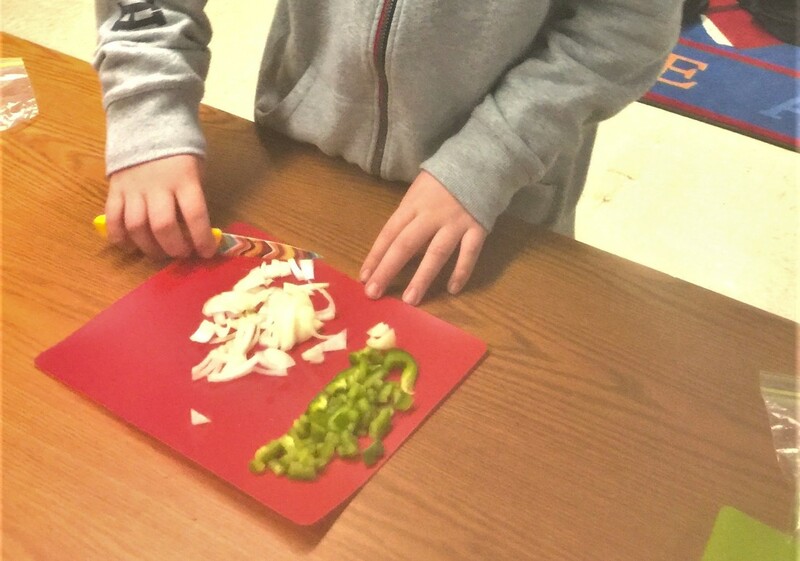 Hampden Meadows students are learning about healthy cooking! 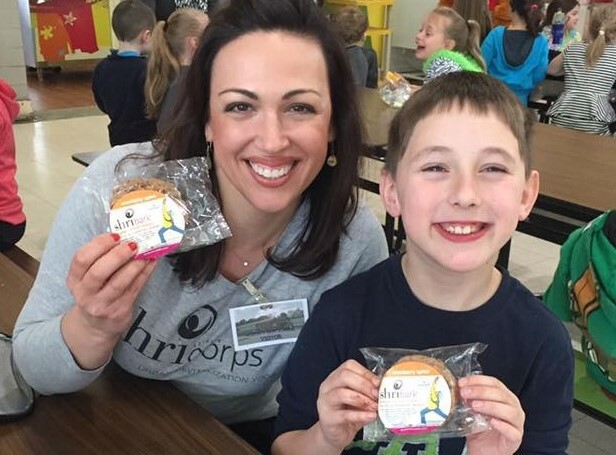 Barrington's food service provider Chartwells, in cooperation with the assistant principal at Hampden Meadows Elementary School, "cooked up" a plan to recognize students for good behavior in school. 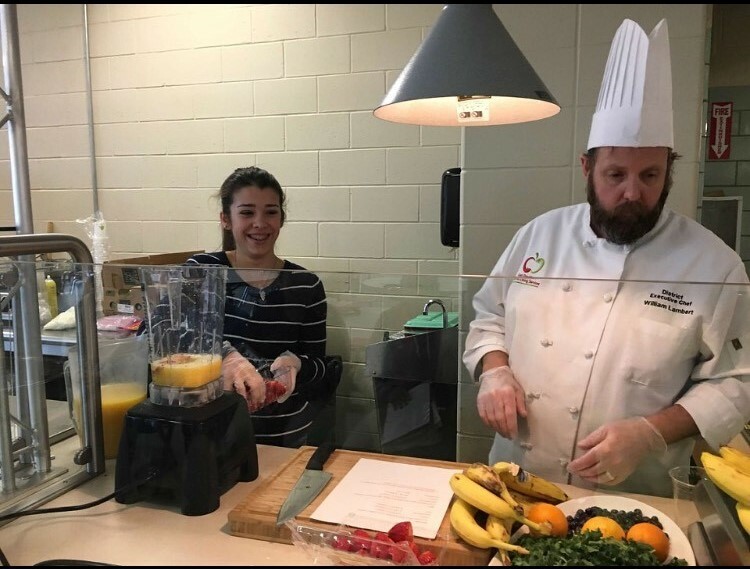 Instead of candy or a pizza party or other unhealthy reward, Chartwells Barrington's Food Service Director, nutritionist and chef organized a healthy cooking class for 21 lucky students. The students thoroughly enjoyed making (and eating) Spinach Pasta Salad, a recipe they hopefully will make for their families as well, using their new healthy cooking skills at home. Way to go Chartwells and Hampden Meadows for a reward that's not only healthy, but teaches students skills and a delicious recipe they can use forever! 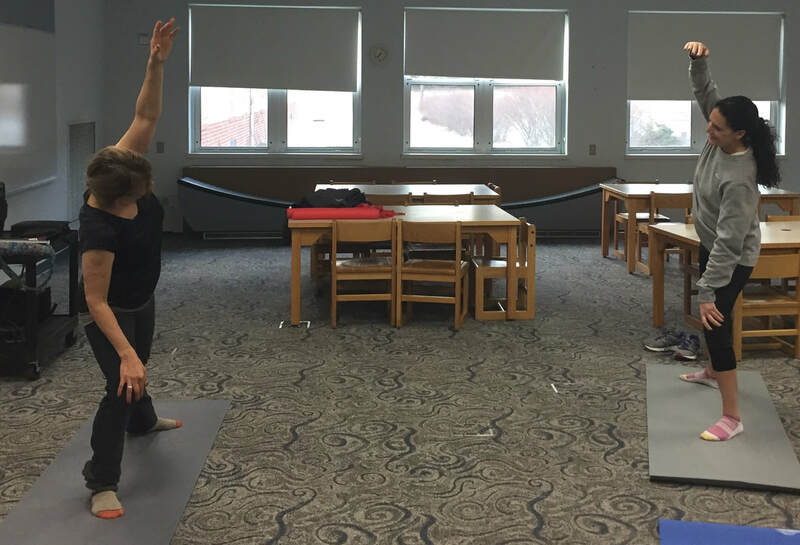 ​North Kingstown High School is making exercise as convenient as possible! 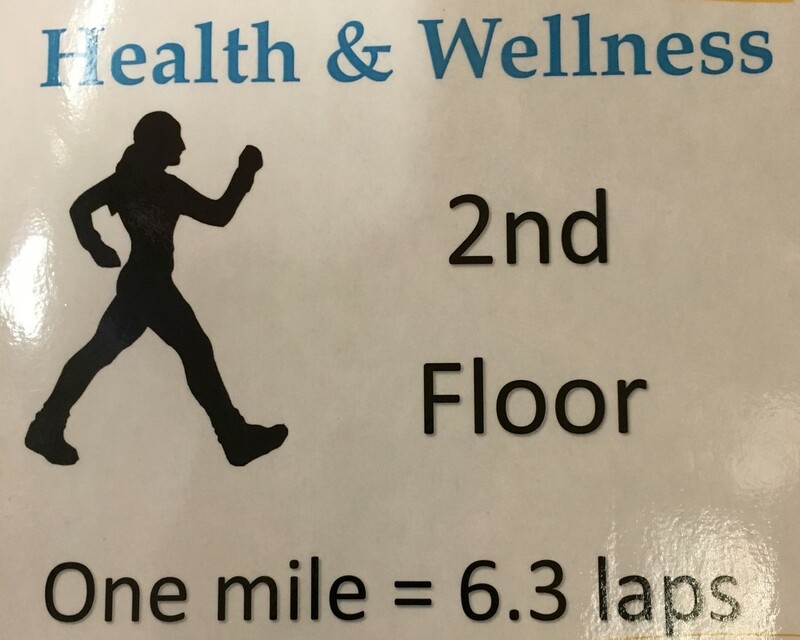 In order to encourage more physical activity for their students and staff, physical education teachers at NKHS, including Julie Maguire, Jonathan Quinn and Karen D’Abrosca, along with the help of student members of the school’s Leadership Club, have mapped out a walking track on the second and third floors of their high school. They measured the exact lengths of the hallways and calculated ​how many repetitions around the “track” would constitute one mile. Colorful laminated signs, designed and created by Ms. Maguire and NKHS student groups, are displayed along the way. North Kingstown takes school wellness seriously, and this indoor walking track is a great illustration of their commitment, and a fun and easy way to get kids (and staff) moving! Westerly’s district-wide “Holiday Hustle” has become a fun and healthy school tradition. The Holiday Hustle is a challenge to staff and students to complete 20 minutes of physical activity every day between Thanksgiving Day and New Year's Day. People get so busy during the holidays and forget that regular exercise is a healthy antidote to stress, fatigue and feelings of depression. It also enhances focus and concentration, and helps boost energy - we can all use that! The Challenge brings Westerly's staff and students together, motivating and encouraging each other to remember the importance of physical activity, especially at this hectic time of year. Participants can join an accountability group and log activity into a Holiday Hustle Spreadsheet, and even blog inspirational messages and fun reminders to each other! This annual wellness challenge was inspired by a former student's Senior Project and is organized each year by the High School PE Department. Way to go, Westerly! ​HAPPY 10TH ANNIVERSARY to Fogarty Walk a Thon! 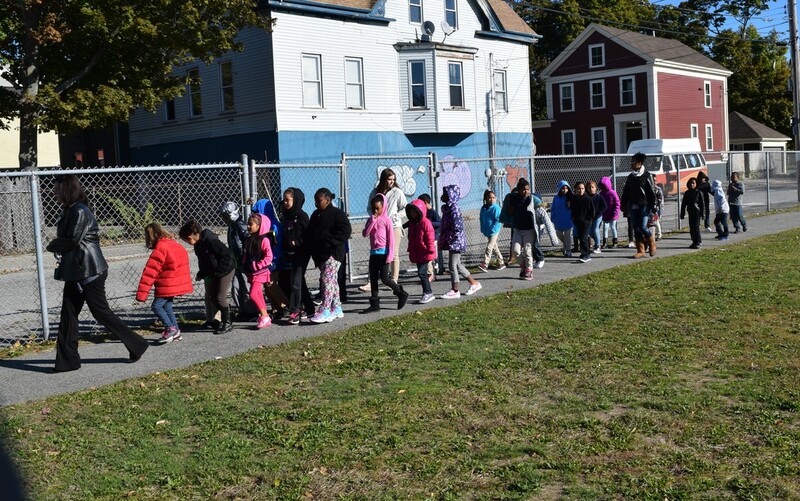 Over the past ten years, Providence's Fogarty Elementary School Walk-a-Thon has been a popular cornerstone of the fall for students, staff and families. Organized for the past decade by classroom teacher Liz Palumbo, the Walk-a-Thon eliminates the need for unhealthy junk food fundraisers and instead involves the whole community in a healthy, active and fun event. Instead of keeping 40-50% of proceeds for selling junk food, this fundraiser allows Fogarty to keep 100% of money raised in their school! Last week, students and staff spent time walking laps around the schoolyard in the beautiful fall sunshine and raised $2500, which will help pay for field trip transportation costs, special class activities and fitness equipment for recess. “It’s great that the students see hundreds of people walking around the field in support of their school,” said Fogarty Principal Courtney Monterecy. Muyideen Ibiyemi is a Providence School Board member who enjoyed his first Fogarty Walk A Thon. “I had the unique opportunity of walking with enthusiastic, dedicated and fun-loving children, and I met new friends. Programs like this should be accorded the best support.” Congratulations to Fogarty Elementary for a decade of teaching their students and families about fundraising with wellness in mind! ​Recess is really rocking in Rhode Island! Recess Regulations – Rhode Island (RI) passed new regulations requiring all elementary schools to provide students with 20 minutes of sustained recess. Although our schools offered students 20 minutes of recess in previous years, we have updated our schedules to include additional time for transition, to ensure that students have an opportunity for a sustained 20 minutes of play during the lunch block in grades K-5. In addition, K-3 schools provide students with an additional 10-minute morning recess break to encourage movement and play. What’s better than these happy, active kids being doused with colorful powder?? When having this much fun also raises $1400 for their school! 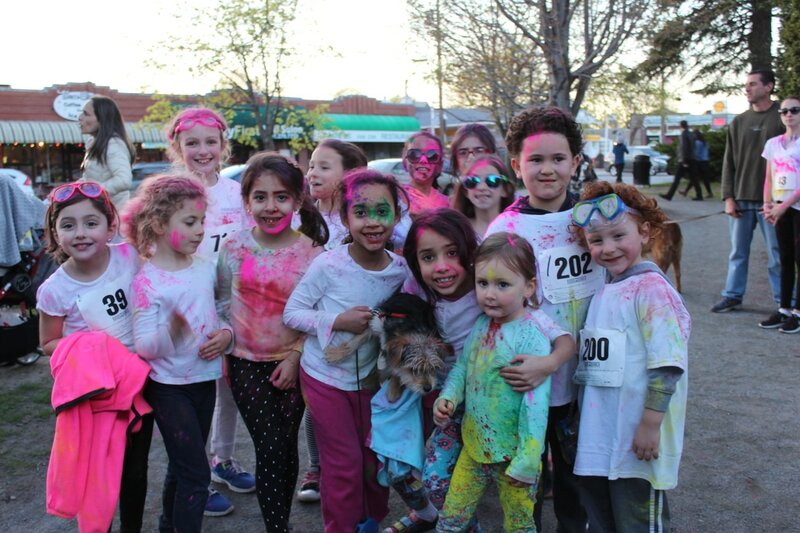 The International Charter School in Pawtucket ran their first Color Run on Blackstone Boulevard in Providence. Under the guidance of Kim Davis, Wellness Committee Chair, and Jenny Catrambone, Wellness Committee member and parent ​the fundraiser, held in conjunction with Rhode Runner Sports, brought out over 320 runners from the school and surrounding community. This fun, colorful and healthy event raised $1400, which will support wellness-related initiatives at the school. With an initial investment of $250 (for supplies) and many wonderful volunteers, the event was a tremendous success and will be an annual tradition at the International Charter School! SNAP-ED NUTRITION EDUCATION PROJECT AT SPAZIANO - students influence menu! ​A group of 5th graders at Spaziano Elementary School in Providence experienced firsthand how persuasive student voices can lead to positive change in school cafeterias. As part of a six-month nutrition education project led by the URI SNAP-Ed Program staff, 50 students at Spaziano completed environmental scans in their school cafeteria this past fall to learn about the types of fruits and vegetables currently served for school lunch, and barriers to eating them. After group discussions and at-home interviews about family recipes, the students then worked in the classroom to develop their own recipes and conduct taste tests with their classmates. 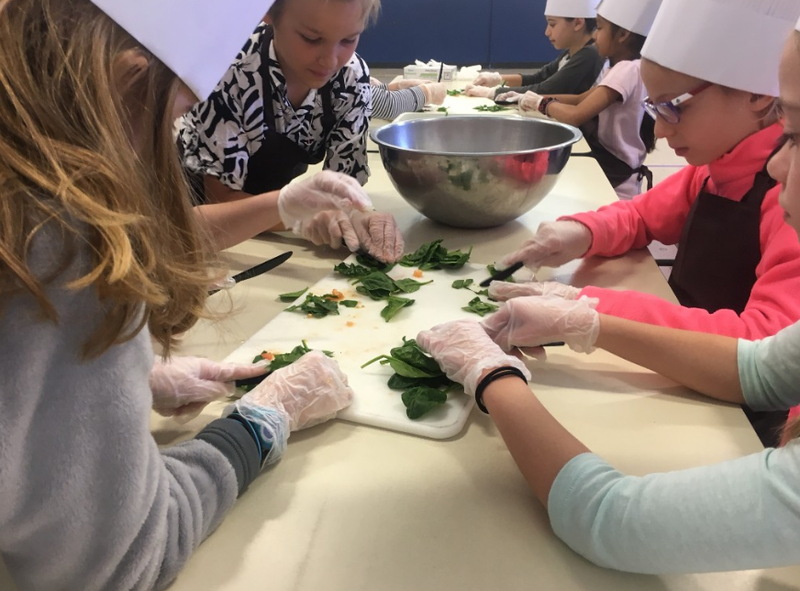 Working with the URI staff and food service provider Sodexo, the fifth grade classes chose a final winning recipe from 40 submitted produce-based recipes to feature as a new school lunch menu item. On Spaziano Garlic Roasted Potatoes Day, students tasted the winning recipe during lunch and voted on whether this recipe should be incorporated into the regular meal program, with an overwhelming majority voting YES. Sodexo Providence has agreed to add Spaziano Potatoes to all elementary and secondary school lunch menus this spring. INTRODUCING SHRI BARK TO RI SCHOOLS! 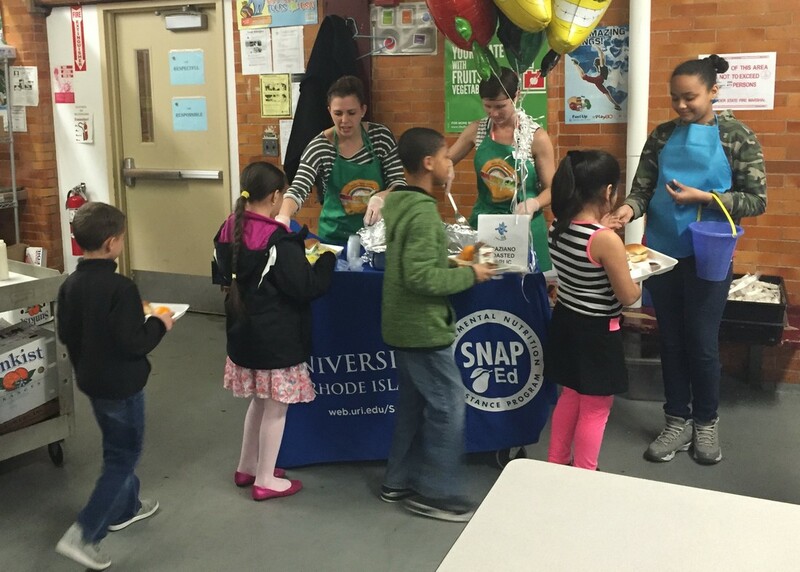 Efforts to build collaborations among RIHSC members have led to some good news for RI students: Shri Bark is now being offered as part of a healthy breakfast program in all of Aramark's Rhode Island school districts, with many Chartwells and Sodexo districts to follow! Shri Bark is a healthy snack developed by the talented and health-conscious people at Shri Yoga, made of all ​natural ingredients like toasted oats, honey, cherries, cinammon and shredded coconut, with none of the preservatives, trans fat, hydrogenated oils and artificial colors that kids don't need. And it's baked right here in Rhode Island! Shri Yoga founder Alison Bologna couldn't be more pleased that so many youngsters across RI will now have access to a healthy, filling and delicious breakfast round. We salute Shri Yoga and Shri Bark! 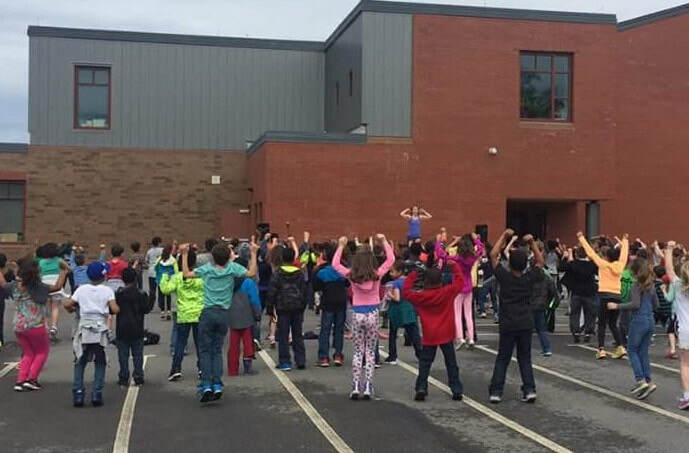 Melville Elementary in Portsmouth participated in the American Heart Association's "Jump Rope for Heart" to the tune of $14,000, the most they've ever raised during this annual event! The students learned about healthy heart habits and that exercise can be fun, while at the same time raising funds to support cardiovascular research and education. Phys Ed instructor Pam Storme, pictured here, led her students to this impressive total.